Did you get your circus tickets yet? Here's an idea...print out this coloring page for the kiddos and exchange it along with tickets to the circus for all that teeth rotting candy they'll get for Halloween. I'm pretty sure a family night out at Fully Charged will be less than the cost of fillings. Spare the dentist, spoil the family! This year Ringling Bros. and Barnum & Bailey presents Fully Charged is taking Halloween to a whole new level! 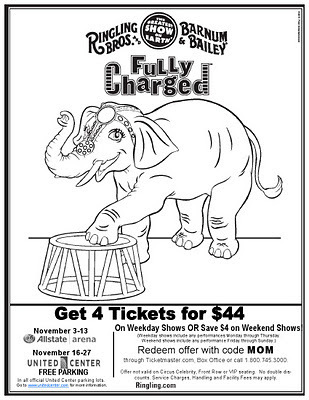 You can Trick or Treat for a FREE Ticket to Ringling Bros. and Barnum & Bailey presents Fully Charged! Parents who visit a Ringling Treat House with children between the ages of 2 and 12 will receive one voucher for a FREE Kid’s Ticket for each child present. 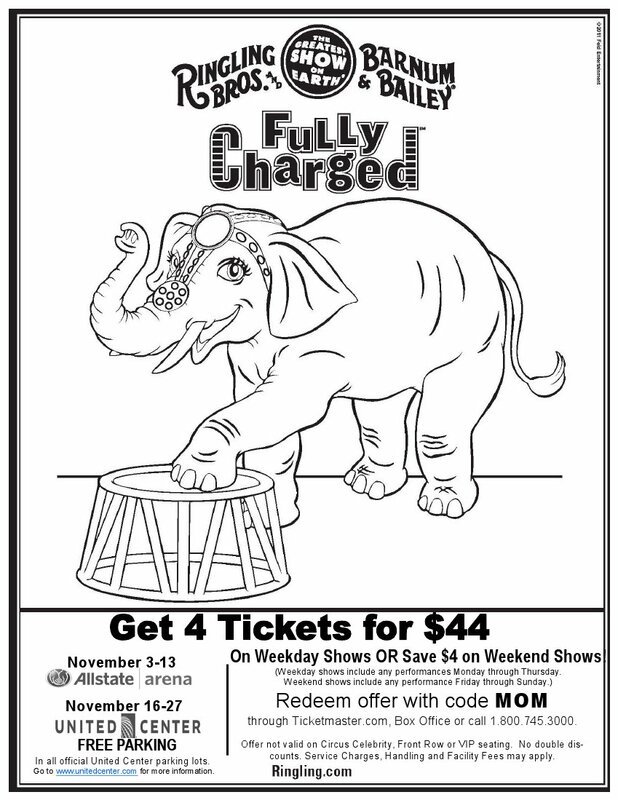 Voucher is redeemable for a ticket to any Monday – Friday performance of Ringling Bros. and Barnum & Bailey presents Fully Charged at Allstate Arena and United Center. Voucher must be redeemed for Kid’s Ticket at the arena box office. Additional tickets and adjoining seats may be purchased at that time. Trick or-Ringling Treating is available on Oct. 31 until the end of the hour noted or until 100 FREE Kids’ Vouchers are distributed at each house, whichever occurs first.